Lyric is a hearing solution unlike any other. As a 100% invisible hearing aid, Lyric is placed in your ear canal by an audiologist at Audiology Central and remains completely invisible to everyone else! Providing clear, natural sound, Lyric fits seamlessly into your life and gives you access to natural sound wherever you go. Unlike traditional hearing aids, Lyric is a 24/7 hearing aid that can be worn through all of your daily activities, from exercising to the shower. With incredible engineering from Phonak, Lyric is designed to work with the natural anatomy of the ear, providing rich sound in a tiny package! Part of the Swiss-based Sonova group, Phonak has been providing relief from hearing loss for over 70 years. You can find their products in over 100 countries globally. Their motto is to provide “hearing solutions that change people’s lives and help them to thrive socially and emotionally.” This philosophy is evident in their latest product, the Audeo Marvel. Fully rechargeable, it is one of the few hearing aids on the market which is able to connect to any smartphone or other electronic device directly. Changing lives since 1964, Unitron is one of the few companies to actively seek and maintain strong relationships with healthcare professionals and work with research institutions in the US and Canada. Founded and based in Canada, their products are known for their high quality and ease of use. 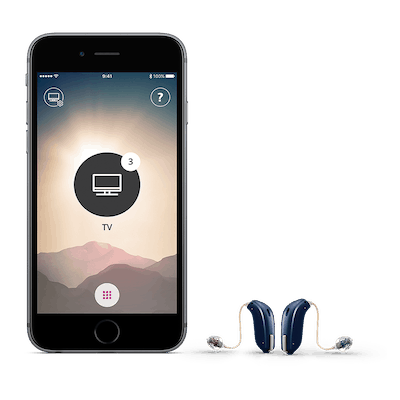 Those who are looking for a versatile hearing aid should check out their Moxi All R. At the time of release, it was the first rechargeable hearing aid that connected directly to any smartphone with a Bluetooth capability. Oticon is one of the pioneers of hearing solutions, founded in 1904. Backed by a rich heritage, they are considered one of the largest companies in the industry – but they are far from complacent! Driving the company is the motto ‘People first’, and the company brings this consideration into every piece of research, every hearing aid model, and every feature that they unveil. Oticon is justly proud of their latest model, the OPN S. This cutting-edge model enables hearing aid users to understand speech in noisy environments as if they had normal hearing. Widex is a hearing aid manufacturer with an established reputation for innovation and quality. They created the first ever digital in-the-ear hearing aid and have been known for their cutting-edge hardware ever since. Those looking for a discreet option should consider their model, the Lyric. It is the only hearing aid that is completely invisible to others. You can enjoy better hearing without people knowing you are wearing a hearing aid. Direct connectivity is one of the flagship features of many of our hearing aid manufacturers. They differ from previous smartphone connected hearing aids as there is no need for an intermediary streamer to connect the two devices. It’s never been easier to take calls, listen to music, or stream a movie directly from your phone to your hearing aid. These models work with the iPhone 5 and upwards, including recent iPads. Note that most of these models will only work with the iPhone, though some offer Android compatibility. For direct connectivity to all smartphones, consider models like the Audeo B-Direct by Phonak or the Moxi All by Unitron. No iPhone? No problem! Many cell phones are compatible with the newest hearing aid technology, call us to find out.